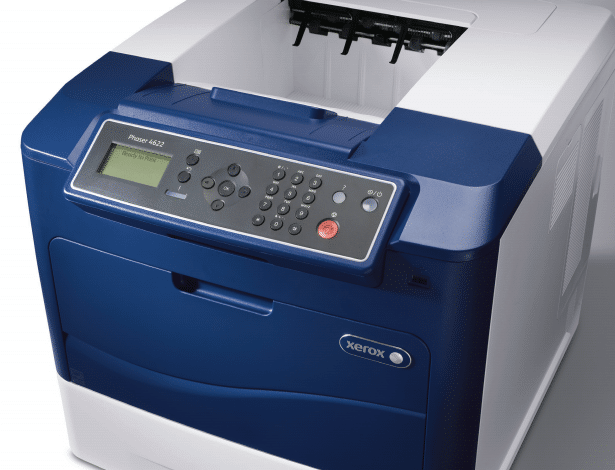 The Xerox Phaser 4622 is a powerful and reliable monochrome printer that can take on the busiest print jobs. It is made to be especially reliable and stay strong as your business grows to new heights. You will get amazing speed that will allow you to do more than ever before. With a print speed of up to 65 pages per minute you can spend less tie waiting around and more time working. You will also be able to get to work right away as the Phaser 4622 cab produce it’s first print in as little as 7.8 seconds. This printer is a workhorse and is all about efficiency. You will be able to start you first jobs in minutes with a simplified front console and automatic set up. And once you get set up you will have a printer that will last you for time to come. The Phaser 4622 is built with a long lift drum and monthly duty cycle of up to 275,000 prints. You will not have to worry about overuse because this printer is built to take on the hardest jobs. Your prints will come at a brilliant print resolution of 1200 x 1200 dpi. It is also built to be especially quiet so it will not disrupt your workplace. Call Denver Copier today if you want to know more about the Phaser 4622. This is the perfect solution for all your monochrome printing needs. At Denver Copier we offer fair leases on the best office equipment available. Call today to get yourself set up with a great printer at an affordable price.